O. J. Simpson (Orenthal James Simpson) (July 9, 1947 - ) was an American Football player of San Francisco, California. Among his many awards, he most notably is a Heisman Trophy winner, an NFL Player of the Year and a Hall of Famer. In 1973, he also became the first running back to rush for over 2,000 yards. Simpson was the paid spokesman for Hertz Rent-a-Car. In 1994 Simpson was notoriously arrested for the murder of his ex-wife, Nicole Brown Simpson, and her friend Ron Goldman. Represented by Johnnie Cochran Jr., and a team of other attorneys, including Robert Shapiro, the following year's trial was often referred to as the "Trial of the Century", Simpson was acquitted. Three years later he was found liable in a Civil Court, where he was ordered to pay a combined judgement of $33.5 million to the Goldman family and to the estate of Nicole Brown Simpson, the beneficiaries of which are her children with Simpson, Sydney and Justin. In 2006 Simpson with Pablo Fenjves wrote "If I Did It" - which detailed how he would have killed his wife and Goldman, had he done it. Public outcry - headed by Fred Goldman (Ron Goldman's father) - lead to the cancellation of the publishing. However, later, the Goldmans were awarded the rights to the book to help satisfy the unpaid $33.5 million wrongful death judgment against Simpson. The Goldmans retitled the book "If I Did It: Confessions of a Killer", and published it in September 2007. This has also raised opposition, including from Nicole Simpson's sister, Denise Brown, who argue that the book's contents are too vile to be published. Simpson, in a 2007 interview, revealed that he is supporting Senator Hillary Clinton for president in 2008. He also revealed during the interview that he is a personal friend of Bill Clinton and has had many social interactions with him, including playing golf and as a drinking buddy. In 2008, Simpson was convicted of multiple felonies and faced up to life in jail. Simpson's lawyer, Yale Galanter, cited the all-white jury as a factor in the conviction. During jury-screening, almost half of the jurors admitted that they believed Simpson had committed the 1994 murders, while the remaining jurors claimed they 'didn't know' or refused to answer the question, leading Galanter to suggest that the conviction was 'payback' for being unable to convict Simpson in 1994. 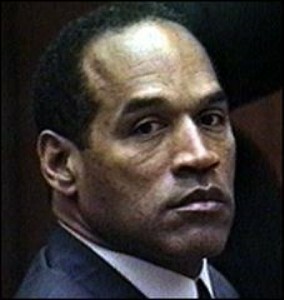 On Friday, Dec 5, 2008 O.J. Simpson was sentenced to prison for his part in an armed robbery in a Las Vegas hotel in September 2007. He was sentenced to "at least 15 years" which means he could be eligible for parole after nine years, or serve as many as 33 years. On July 20, 2017, Simpson was granted parole, and released on October 1, 2017. ↑ 1.0 1.1 O.J. SIMPSON (English). Official Site of the Pro Football Hall of Fame. Retrieved on 2007-09-16. ↑ 4.0 4.1 Goldmans say they're punishing O.J. with book (English). MSNBC. Retrieved on 2007-09-16. ↑ "O.J. Simpson goes free: Live updates", CNN. Retrieved on July 31, 2017.